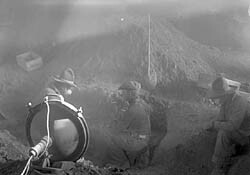 Three men excavate a cave in Spruce Tree House at Mesa Verde National Park sometime between 1915-1926. Photo taken by Jesse L. Nussbaum. Photo from the Western History/Genealogy Department, Denver Public Library. The first major U.S. law to address the preservation of archeological resources is the Antiquities Act of 1906. Its primary focus is the protection of archeological sites from looting, which was widespread in the southwest in the late 1800s, as it is now. The Act establishes the permit process for archeological excavation on federal and tribal lands in an effort to deter destruction of sites by anyone who is not a professional archeologist. It establishes fines and punishment for unauthorized excavation or looting. It also allows the president to declare historic or prehistoric sites or structures as national monuments, as President Clinton did several times during his presidency. The Antiquities Act also contains a stipulation for the curation of archeological collections, stating that "the gatherings [of artifacts and data] shall be made for permanent preservation in public museums." Importantly, the law implies that decisions for the care and management of the recovered collections should be made before a permit is granted. The Act and its accompanying regulations, Preservation of American Antiquities (43 CFR 3), do not contain any specific guidelines or standards for carrying out the curation of archeological collections. The regulations, however, do cover several significant issues. First, they mandate that the permittee must submit a catalog of the collection recovered and photographs made during the field season to the Smithsonian Institution and indicate if any items may "be available for exchange" (43 CFR 3.10). Second, any object of antiquity or collection that is seized due to excavation without a permit or other reasons contrary to the Act are to be "disposed of as the Secretary shall determine, by deposit in the proper national depository or otherwise" (43 CFR 3.16). Third, the regulations mandate that collections "shall be preserved in the public museum designated in the permit and shall be accessible to the public (43 CFR 3.17). If a public museum closes down, then all federal collections in that museum "shall thereupon revert to the national collections and be placed in the proper national depository" (43 CFR 3.17). Unfortunately, no other law mentions any aspect of the management of archeological collections until some 70 years later.